Fast, affordable, and designed to handle everything from simple color jobs to complex workflows. Quickly and reliably digitize larger projects with scan speeds up to 24 ppm/48 ipm and a 50-page ADF. Recommended for 2,000 pages per day.Small size. Fast scans. Same reliable results: Produce scans at up to 24 ppm/48 ipm with two-sided scanning that captures both sides at once. Free up space for work. 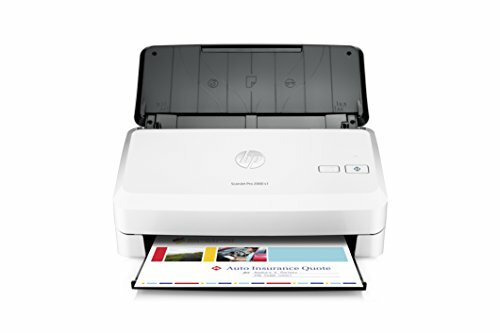 This HP ScanJet Pro is small and slim—a modern design perfect for the desktop. Don’t wait for warm-up—HP Instant-on Scanning lets you begin scanning quickly. Load up to 50 pages into the automatic document feeder for fast, unattended scanning. Optimize workflows with one-touch scanning: Streamline routine work with one-touch scanning—create one-button, custom settings for recurring scan jobs. Scan images directly into applications with included and full-featured TWAIN and ISIS (R). Easily transfer scans into editable text, secure PDF files, and more file types, using built-in OCR. Quickly share or archive scans directly to popular cloud destinations with HP Scan software. Capture business documents like a pro: Define scan profiles for common document types, and scan to multiple destinations with HP Scan software. Capture and organize documents, business cards, and other file types with feature-rich software. Produce clear, legible scans—up to 600-dpi resolution.